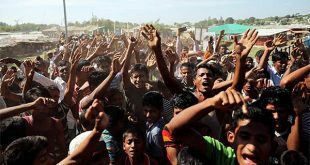 COX’S BAZAR, Bangladesh, Sept 11, (Agencies): Bangladesh has agreed to free land for a new camp to shelter some of the hundreds of thousands of Rohingya Muslims who have fled recent violence in Myanmar, an official said Monday. 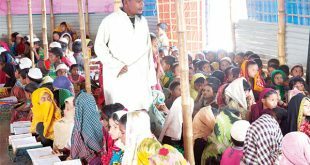 The new camp will help relieve some pressure on existing settlements in the Bangladeshi border district of Cox’s Bazar, where nearly 300,000 Rohingya have arrived since Aug 25. “The two refugees camps we are in are beyond overcrowded,” said UN refugee agency spokeswoman Vivian Tan. 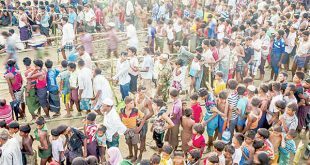 Other new arrivals were being sheltered in schools, or were huddling in makeshift settlements with no toilets along roadsides and in open fields. Basic resources were scarce, including food, clean water and medical aid. Still, more refugees were arriving. An Associated Press reporter witnessed hundreds streaming through the border at Shah Puri Dwip on Monday. “Tomorrow we are expecting an airlift of relief supplies for 20,000 people,” Tan said. 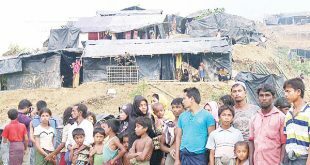 Prime Minister Sheikh Hasina had offered 2,000 acres (810 hectares) near the existing camp of Kutupalong “to build temporary shelters for the Rohingya newcomers,” according to a Facebook post Monday by Mohammed Shahriar Alam, a junior minister for foreign affairs. He also said the government would begin fingerprinting and registering the new arrivals on Monday. Hasina is scheduled to visit Rohingya refugees on Tuesday. Meanwhile, the Organisation of Islamic Cooperation (OIC) on Sunday condemned Myanmar for “systematic brutal acts” against its Muslim Rohingya minority and asked it to accept international monitors. 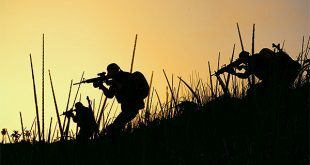 The 57-member OIC, meeting in Astana, expressed “serious concern about recent systematic brutal acts committed by the armed forces against the Muslim community of Rohingya in Myanmar.” It urged Myanmar to accept UN monitors to carry out “a thorough and independent investigation of all established violations of international human rights … and bring those responsible to justice”. The current OIC chief is Turkish President Recep Tayyip Erdogan, who has been one of the loudest critics of Myanmar’s policies against the Rohingya. The Rohingya are reviled in Myanmar, where the roughly one million-strong community are accused of being illegal immigrants from Bangladesh. Iranian President Hassan Rouhani and Afghan leader Ashraf Ghani were among the other heads of state who attended the summit hosted by Kazakhstan and the Central Asian country’s veteran autocrat Nursultan Nazarbayev. 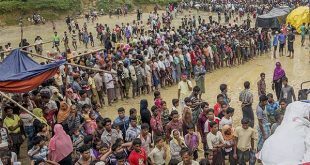 Myanmar on Sunday rebuffed a ceasefire declared by Muslim Rohingya insurgents to enable the delivery of aid to thousands of displaced people in the violence-racked state of Rakhine, declaring simply that it did not negotiate with terrorists. The Arakan Rohingya Salvation Army (ARSA) insurgent group declared a month-long unilateral ceasefire, starting on Sunday, so that aid could reach these people.